After days of traveling the blessed back roads, we were excited about high-rolling it on Saturday to the bright city lights of Las Vegas. Our group split into two camps for the day. Both left from Williams, Ariz., with one headed to the heart of Sedona and then to the Hoover Dam while the other did Vegas directly, stopping at the famous Gold & Silver Pawn Shop, as seen on the popular TV show “Pawn Stars,” and then at the local Harley megastore. There was some excitement on this leg. For one, I was cruising along quite contentedly about 70 mph, approaching Vegas, when a flippin’ wasp made a beeline right into my shirt and stung me. I’m grateful there was no video camera catching all my frantic twitching and wiggling while I fought to get that sucker out from where he didn’t belong. I survived; it did not. The second news flash is that we had a surprise wedding among our riders. Two of our rider pals from the HOG Club in Pensacola pulled a fast one and got hitched in Vegas. Elvis crooned three wedding songs and delivered the nuptials. For the rest of the ride our happy newlyweds, June and Jerry Schwartz, rode with big grins on their faces and a garter hanging off their rear bag. The evening in Vegas was a blast! A few of us attended the “Beatles Love” show by Cirque du Soleil, some saw the Blue Man Group and others just strolled the Strip and enjoyed the nightlife. Vegas was high-energy and high rollers. You’d never know we’ve been in a recession, based on the impressive size of the crowds, accents overheard from many foreign countries and the ringing orchestra of cha-ching in every jam-packed casino. Sunday was one of the more challenging days of our tour. After battling chilly weather for days we were all looking forward to the warmth of the West Coast, but none of us in our wildest dreams expected to face scorching temperatures soaring to 108 degrees. 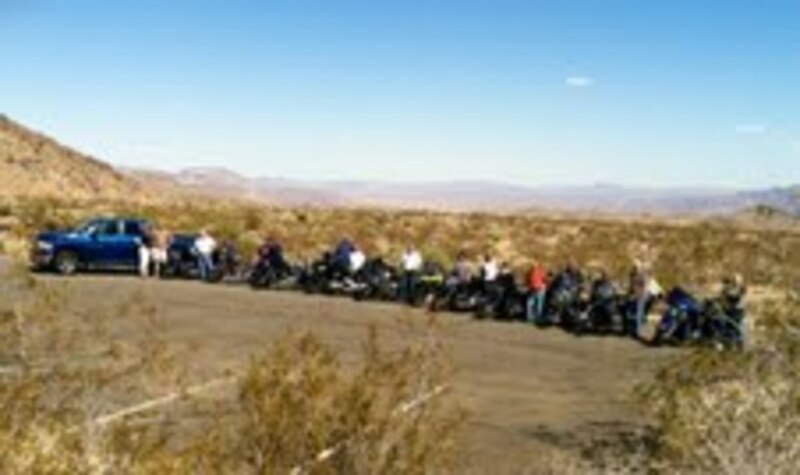 The morning ride was toasty, but pretty fun as we zipped through the Mojave National Preserve, led by our California duo of Phil and Cam Arnold. We rode through a thick forest of uniquely twisted Joshua trees, the Kelso Dunes and the Amboy Crater, geology lessons courtesy of Phil. We stopped at a former train depot that housed a small but very interesting museum with artifacts from the area. 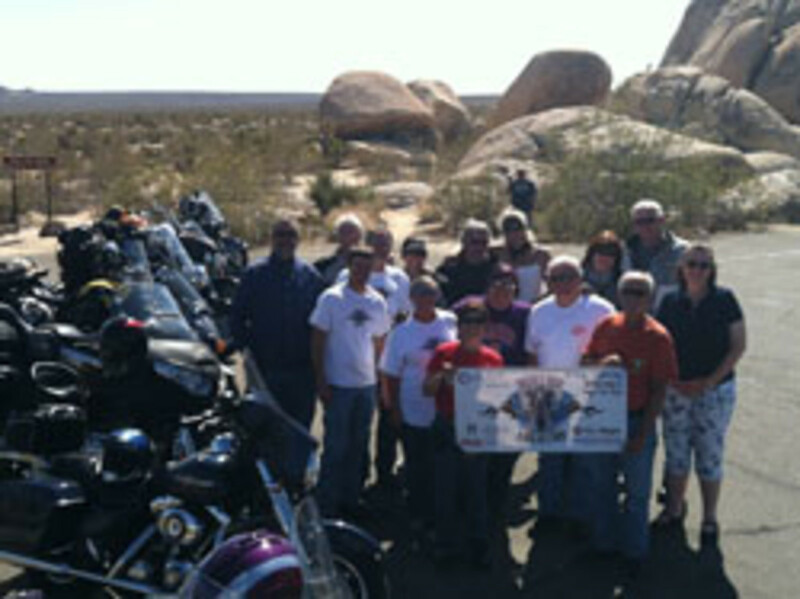 And then we headed to Joshua Tree National Park for an afternoon ride that no one in this group will soon forget. The heat was blistering. After we paid the entry fee we discovered firsthand (with no warning by the park ranger on duty) that the main road was under construction for miles, leaving only a gravel bed to ride on (a no-no for riders). Eventually, we all slid on over to the asphalt in the other lane for oncoming traffic. If that wasn&apos;t enough, the speed limit was only 25 mph, so we rode in oppressive conditions for what felt like an eternity in what felt like the dry rock pits of hell itself. There wasn’t one sign of life to be found; no indigenous tortoises, rabbits, snakes, etc. By the time we reached our destination in Palm Desert, I felt as if I were breathing fire; before I could even lick my lips, moisture evaporated. When I arrived at the hotel I took a deep breath and ceremoniously dumped a bottle of water over my head. The others were a little more dignified and headed straight for the pool. In retrospect, we were all grateful, especially on this leg, to have our transport truck and crew along for the ride. Had any of us broken down or needed to retreat to air conditioning, help was there. Thank goodness we all survived a grueling day, but a special thanks to My-Villages and Southeast Marine Sales & Service for sponsoring this critical aspect of our trip. We appreciated you! Once we were all refreshed and rejuvenated, a few of us got into the truck and drove over to neighboring Palm Springs, where we caught the last aerial tram scaling an 8,000-foot-plus mountain. It was a thrilling ride to the summit at twilight and a very cool way to wrap up one hot day. Next: our final ride and splashdown in San Diego. 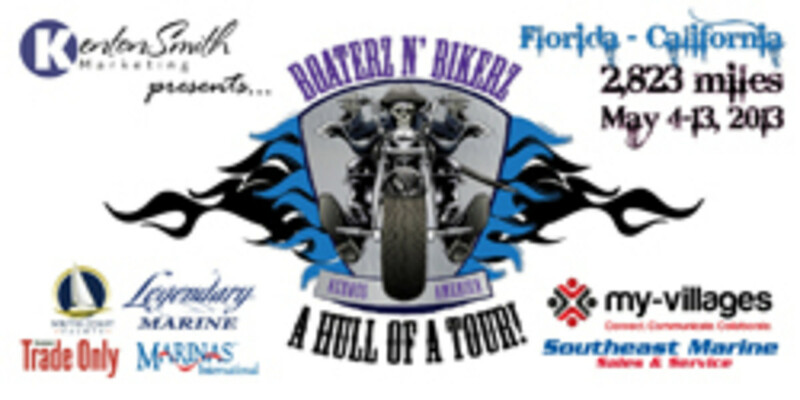 Thanks to the “Boaterz n Bikerz Across America: A Hull of a Tour” sponsors joining presenting sponsor Kenton Smith Marketing, including Legendary Marine, Marinas International, South Coast Yachts, My-Villages, Southeast Marine Sales & Service and media sponsor Soundings Trade Today. Wanda Kenton Smith is an award-winning, 31-year marine industry marketing veteran based in Destin, Fla. She is president of Kenton Smith Marketing (www.kentonsmithmarketing.com) and president of Marine Marketers of America. She will file occasional reports on her tour across America.